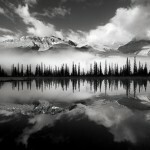 Here is another shot from my quick trip up to Herbert Lake last week with Wayne Simpson. 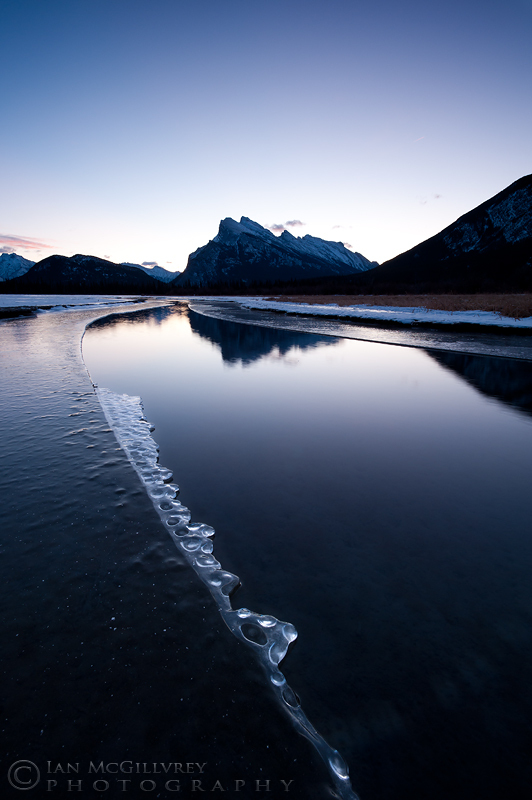 (Make sure you stop by his blog too by the way, and check out his shot from the morning) After a stop for coffee in Lake Louise, we decided to jump on the Bow Valley Parkway for the ride back towards Banff to see if we might find some wildlife to shoot. While we ended up not seeing a single critter the whole way, we did find some nice light to shoot in at the Muleshoe picnic area. With the sun not very high in the sky yet, the light was still relatively soft and the fresh snow was backlit and sparkling beautifully. The aspen trees were kind of caked with snow on one side which made things a little challenging being that they really only looked good from one angle, and that we were shooting straight into the sun! Up for a challenge, we set out with telephoto lenses trying to isolate groups of trees against the cool white and blue backgrounds. Unfortunately for me, I was just not making it work and having a hard time capturing anything I really liked. 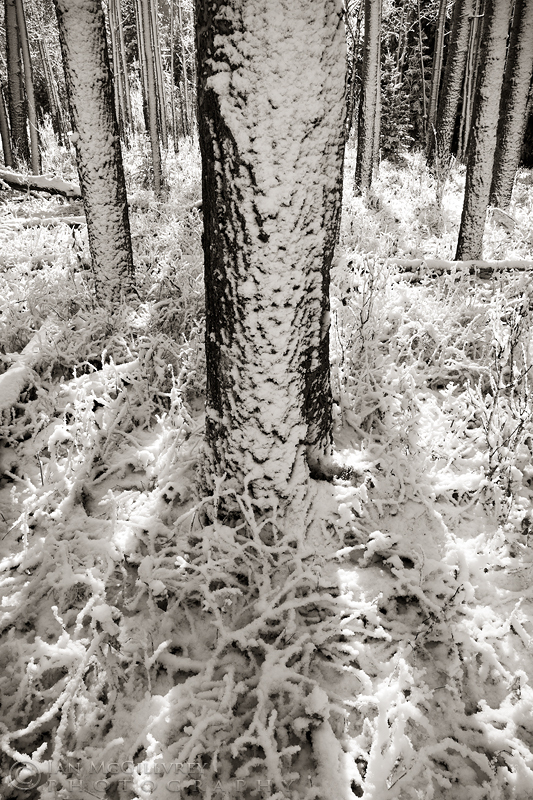 It wasn’t until pulled out the wide angle lens and got right down into the trees and up close that things started to look interesting. Here’s what I ended up with, hope you like it! Ok, I’ll admit that my archives are a pretty shallow pool to draw from, being as new to this as I am, so this isn’t going to be taking you “way back when” or anything like that. I was just looking back through some images from earlier this year, and came across a few shots that I had overlooked for some reason. 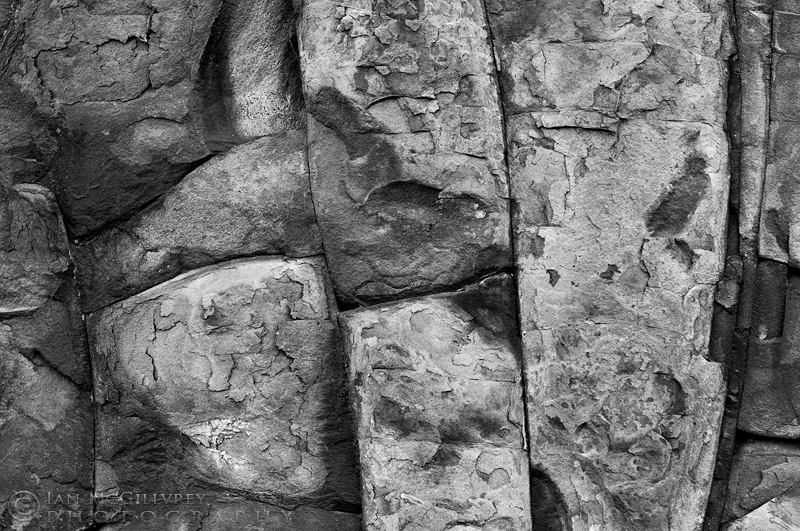 On the way back from a quick morning shoot out in Kananaskis Country this past August, I had stopped to try to get some detail shots of this section of rock along the side of the road. I really hadn’t thought much of them at first, but after looking at them again and deciding to try them in black and white, I’m actually pretty pleased with them now. It’s kind of nice when it works out that way… most of the time when I look back at old stuff I just see all the mistakes I made. Well, after a couple of busy weeks, I was finally able to get away for some shooting today and had a great time being out with friend Wayne Simpson. We headed out to Kananaskis Country to shoot the sunrise at the Upper Kananaskis Lake. Neither of us had been up there shooting yet this winter so we were going in a little bit blind, not knowing what we had to work with for conditions along the shore. Despite getting up there really early and having lots of time to look around we both had a really hard time coming up with decent compositions. We had great pre dawn light with really nice pastel colours in the sky but just couldn’t seem to find the right foreground elements to build very strong images. I wouldn’t say that we came up totally empty handed though, it just felt like we had to work a little harder for it today. 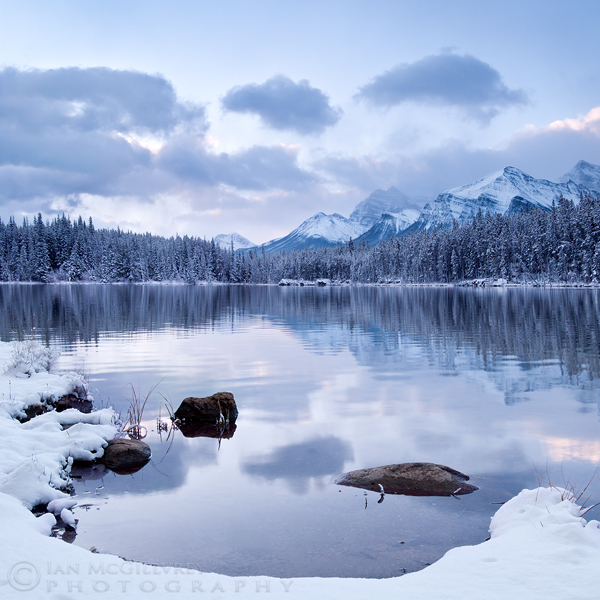 It’s funny, I was just working on this image from my trip to Herbert Lake with Wayne Simpson about a month ago and getting ready to post it when I noticed that just this afternoon, Wayne had posted another one of his shots from the same trip over on his blog. Honestly, we didn’t plan that! Similar to the last shot I posted from this shoot, I was looking for a wider field of view and decided to stitch 2 images together for the final image. 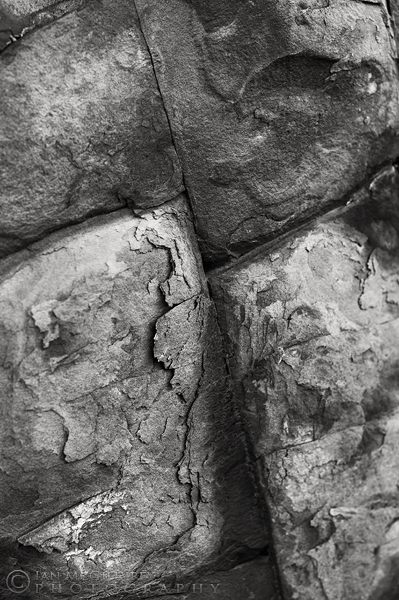 This was 2 horizontal images stacked vertically and then cropped to an 8 x 10 format. The light had become a little harder by this point in the morning and the colour was less appealing, so I decided to go with black and white for this one. Hope you like it! 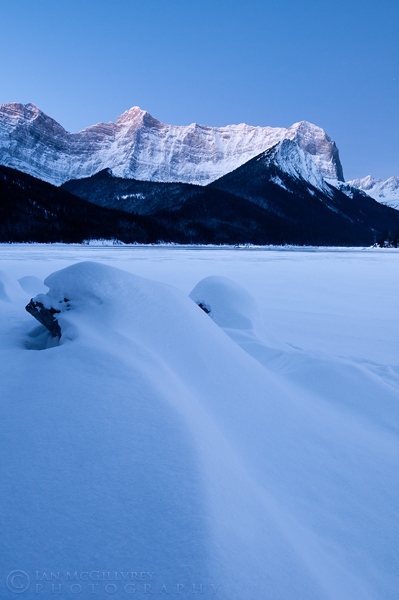 Earlier this week, Wayne Simpson and I headed out to K-Country again to shoot the sunrise at the Upper Kananaskis Lake. The last time we were there a couple weeks ago we had intended to hike out around the shore of the lake to a new spot we’d been eying up that neither of us had shot from before. For whatever reason (most likely just laziness! ), we didn’t end up making the trek, so this time out we decided to go for it. Arriving well before sunrise, we set off through the fresh (and deep!) snow by the light of our headlamps. We weren’t quite sure what we would find when we got there, but we were optimistic that we would be in a good position to catch the light hitting the peaks across the lake. I’d say that our instincts on that were right, and thankfully we were awarded with some pretty nice sunrise light for a few brief moments. 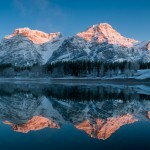 Here’s one of my images from the morning, I hope you like it! Well it’s the beginning of a new year and I figure now is as good a time as any to start a new project here on the blog. I guess it’s not so much of a project as it a commitment. In an effort to push myself to be creating more work on a consistent basis, I’m starting a weekly photo post. Every Monday I will be posting a new image and my goal will be to have produced each image from sometime within the two weeks prior each post. Hopefully, a year from now I’ll have a nice stack of 52 images to look back on! Here’s my fist image, it was taken exactly 2 weeks ago out in Kananaskis Country. 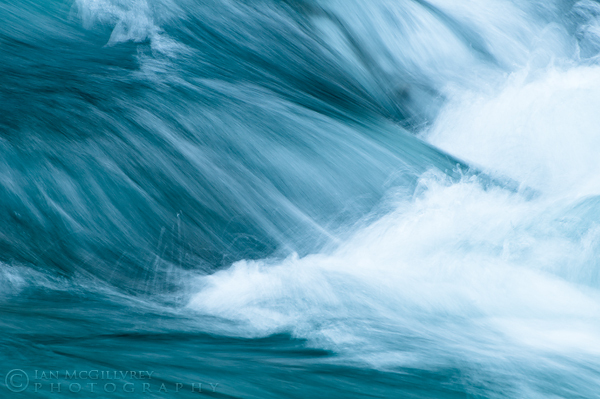 The Kananaskis river at the Canoe Meadows area has a very intense colour to it and the rapids make for great abstract type photos. I tried several different compositions with shutter speeds ranging from 1/4 second all the way up to 13 seconds. This one was shot at 1/5th of a second and ended up as one of my favourites from the shoot. Hope you like it too! Here’s a shot from Kananskis Country a couple weeks back of a very obliging young moose we encountered just off the side of the road. While my focus is usually on making landscape images when I’m out shooting and not pursuing wildlife, every once in a while I’m able to get a critter in the viewfinder. I try to remember to keep my longest lens, (70-300) attached when I’m on the road for occasions like this one. I don’t have any really long and fast glass, and I’m certainly a long way from calling myself a wildlife shooter, but I kind of like this one. 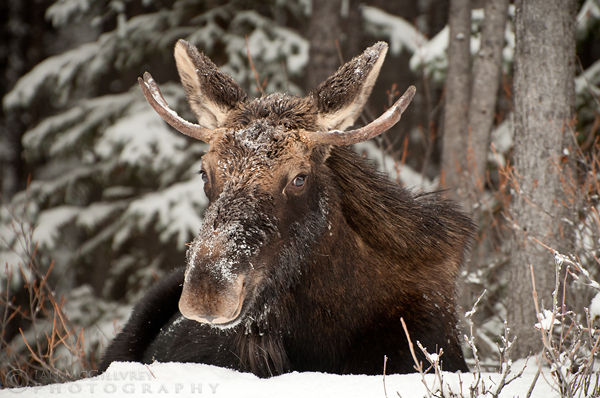 He reminds me of the main character in my 16 month old daughter’s favourite book right now, “The Little Moose”. 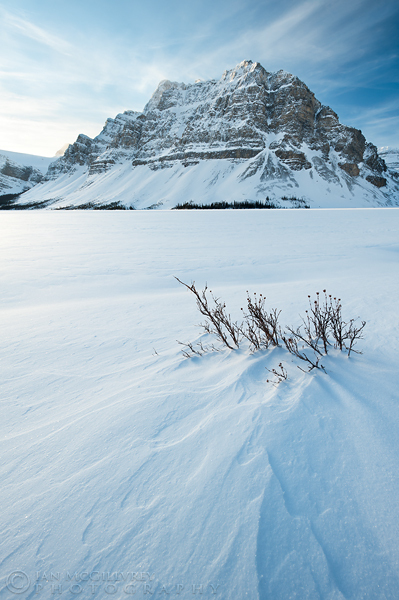 This week’s photo was taken on a chilly and clear morning up at Bow Lake on the Icefields Parkway last week. I arrived well before sunrise to allow myself enough time to hike out to the shore of the lake and find a spot to shoot. Thankfully, I had left quite a bit of time because I hadn’t counted on the waist deep snow and complete lack of a trail or ski track going out to the lake from the parking lot. After post holing my way out the lake and trying to avoid walking through any potential shots, I was thoroughly exhausted and eager to purchase a pair of snowshoes as soon as I got back to town! With clear skies and thick cloud to the east, there really wasn’t much for colour and dramatic light for the sunrise unfortunately. Thankfully though, a few clouds eventually started to form and the wind was blowing nice streams of snow off the tops of the peaks. I used a polarizing filter on this shot to help bring out the clouds and darken the blue sky. This was also my first shoot with my new full frame camera body, the Nikon D700 and I’m thrilled with finally being able to shoot truly wide angle shots with my 17-35. For those of you that don’t speak camera tech, my apologies… let’s just say that I REALLY like my new camera and leave it at that! This week’s photo was taken on the same outing as the image from last week which was exactly 2 weeks ago today. While I was taking my usual way back from Lake Louise along the Bow Valley Parkway, I stopped at Baker Creek to try to make some detail images of the ice formations along the edge of the creek. With the limited amount of open water and challenging vantage points to choose from, I struggled a little here at first, but after spending some time and looking a little harder I was able to come up with a couple of compositions I was happy with. 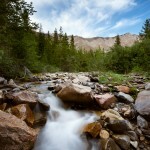 The biggest challenge here was capturing the motion of the completely clear water. I had started out by using a polarizer as I normally would for a shot like this, but I found that without the reflections on the surface, the water was just disappearing completely from the image. I ended up rotating the polarizer back to where it was least effective and made use of the reflections to bring out the detail in the water. To give the image to cool look I was after, I first converted it to black and white, and then toned the shadow areas a deep blue colour. 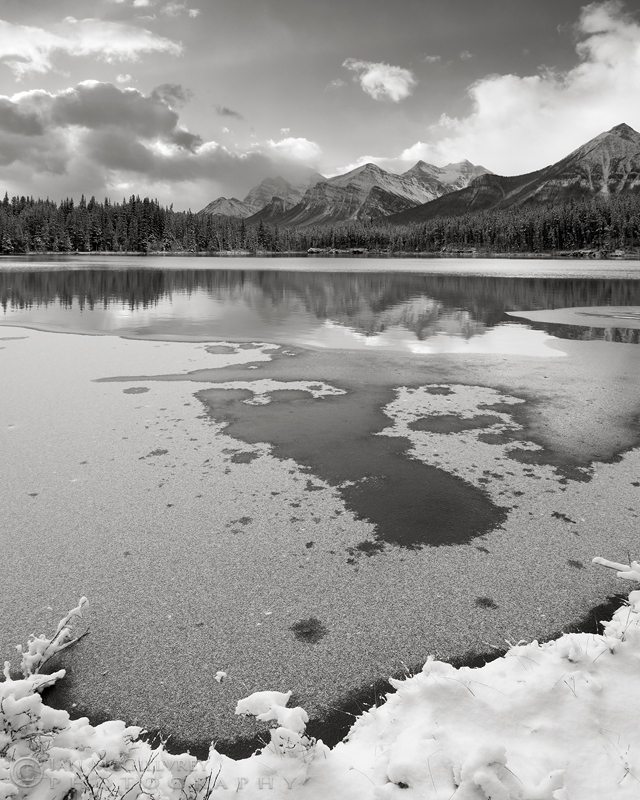 This week’s photo was from a quick run out to Vermillion Lakes near Banff with Wayne Simpson about a week and a half ago. 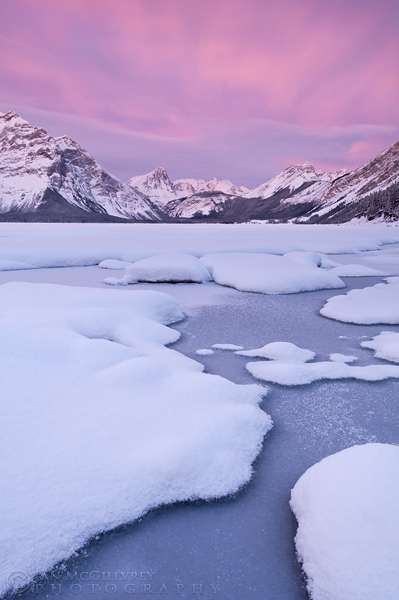 The sunrises here can be outstanding this time of year, and the open water and ice formations provide lots of interesting foreground potential. Unfortunately for us, on this morning we had a clear blue sky and very little interest and drama in the sky. I’m sure not having much luck with sunrises the last little while! Oh well, it was still a great morning to be out with a good friend making images. For this image, I shot two images focused at different points in the frame and then stacked them together. 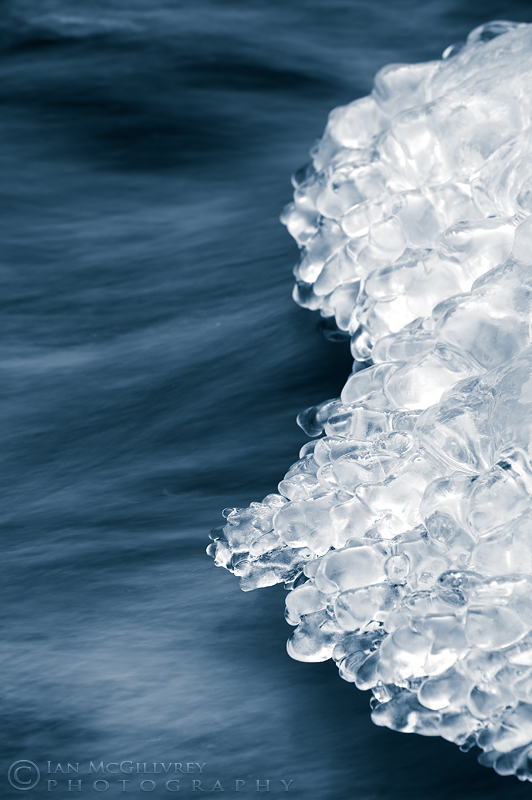 This allowed me to get the ice which was less than a foot away from the lens in sharp focus as well as the distant peak. 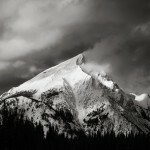 I also used a 3 stop soft step filter to darken the sky gradually down towards the peak. While the colour and drama in the sky is certainly lacking, I liked the simplicity of this one and subtle transitions in the colour throughout the image. 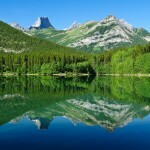 Well, I’ve just returned from a 3 day trip out to the Rockies with Wayne Simpson. Based on the conditions and weather, we ended up spending most of our time at Abraham Lake which is an area I’ve been wanting to shoot for quite some time now. Both Wayne and I were introduced to Abraham Lake through the work of Darwin Wiggett who has really popularized the area with photographers in the last few years. Be sure to check out his amazing images from here and if you’re interested, his workshops and photo tours in the area as well (I believe there may also be an e-book on the area on the way too). Thankfully for me, Wayne had shot here before and knew where some of the better spots to shoot were, so I guess I should say thanks to both Wayne and Darwin for this one! I made this image at sunrise as the sky just teased us with this little splash of colour. This turned out to be the only colour we would see in the sky for the entire trip, so I was glad to have gotten this one. 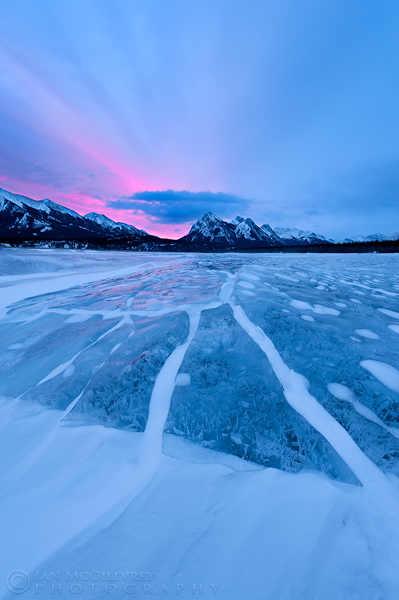 The ice cracks and bubbles you see in the foreground are some of what Abraham Lake has become so famous for… that and the wind! What you can’t see in this image is that we were getting absolutely blasted by the wind coming straight towards us. Our faces and eyes were certainly feeling it after spending the entire day from before sunrise to after sunset essentially staring face first into the gale force wind. It was enough to blow us and our gear across the the ice at times! But it sure was fun! 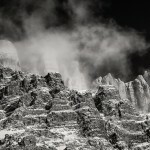 Stay tuned for more images from the trip coming this week, and be sure to check out Wayne’s blog for his images as well.